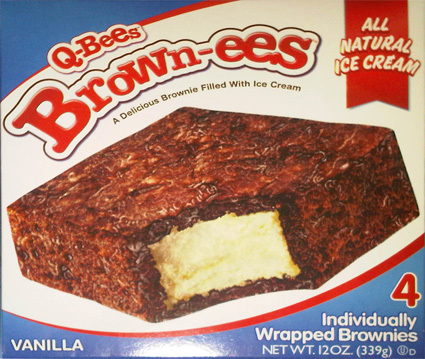 On Second Scoop: Ice Cream Reviews: Q-Bees Brown-ees How could I resist? As I sit here enjoying a nice fresh back of marshmallow oaties, I need to tell you about our fun trip to Whole Foods today (mmmm, oh I adore this cereal, it's like lucky charms before it got bitten by artificial colors, preservatives, and flavors). I won't keep you in suspense, so let me show you what we found. OH YAY!!! You have to have a steel fortitude to walk by this treat and not wonder how amazingly awesome it must be! Just to taunt us, there was just ** 1 ** box left! You know what the great news is? I'm about to save you $4.99. You know, that's not a bad pic considering it came from a blackberry. 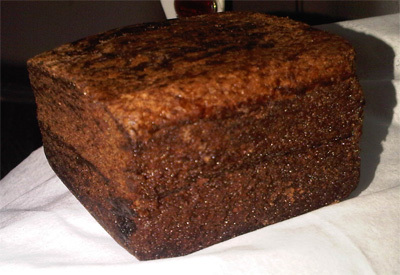 You can see that there are two brownies coming together and ofcourse it doesn't look anything like the box. The box makes you think it's a fairly standard size brownie filled with ice cream yet it's not nearly as big (wide) but it's also thicker. Hmm, let's look closer. Well, there is confirmation that the box art is wrong, shocking! Ok, enough sarcasm. I can't say I'm really surprised by this since the original QB treats (review) also had a massive shell, I just get frustrated because the picture psyches you up for one ratio and then the actual treat is the total opposite brownie to ice cream ratio. No matter, just details. The treat seems small, but once you unwrap it, it does have some heft to it (3oz to be precise). It looks solid and it tastes... well, it tastes solid too. It's a very heavy brownie and i'm kinda digging the whole texture of this treat. Problem is, I'm not truly enjoying the overall taste of the treat. Hmm, let's check in with my daughter. "If something isn't bad, then I'll finish it, but if it's horrible, I don't want to finish it. Rough, but wow, my daughter doesn't want an ice cream filled brownie. I'm shocked really, and I know she's gotta be pretty hungry, so there's a huge no vote on this one. Me, well, like I said, the texture is pretty good, but the brownie taste is failing. It's not awful, but something ain't right. Maybe brownies just don't freeze well, but I think this treat would benefit from a bit more tweaking. Let's see if we can get one more vote. I wrap the box in my coat, and then another coat and we head home. The treats survive and my wife goes in to take the winning vote... not bad, but not great, so basically what I said. So, there you have it. Feel free to save yourself $4.99. Damn, it's such a great idea - I wish they could deliver with the flavors. All of Q-Bee treats are bordering on uneatable. Just bought some for my kids as a treat. Even they didn't want them after a few bites. My apologies to your children! Not sure how these people stay in business, no repeat customers will only get you so far. You people are insane! I'm not sure what you have against ice-cream and brownies. But you must be in the .09% of the population that doesn't like these. Your arguments are stupid and frankly laughable. Who cares about the picture on the box. The treats are incredibly tasty. I bought some for my 9 year old twins birthday party and the kids loved them. Their mom's hounded me for days on where they could get these. So I contacted Fresh Direct and they shipped them to each of them right away. I don't know what you people like to eat or where you live....but those of us here in New York City, love these. Hey, everyone is entitled to their opinion, but as you may have noticed from other peoples comments, we try to keep things a bit more civil around here. Obviously somebody likes these treats since they are still in business, but I would consider you in the minority, not us.